Over the holiday break, I was listening to NPR and heard a story that piqued my interest. A broke college student, looking to make some extra money started selling ugly Christmas sweaters. You know, those horrendously outdated sweaters, that used to be oh-so-cool like thirty years ago. Well, ugly sweaters are back in style and it’s become a staple at holiday parties of all kinds — even making the rounds at corporate events. The young man in question spent the summer scouring for sweaters, to get ready for the busy season, roughly a few weeks before Christmas. His “side business” is now so successful that he made $50,000. He made $50,000 selling ugly sweaters that he bought from thrift stores. Can you imagine the profit margin on that? While it may seem like a silly story, he is laughing all the way to the bank and making a ton of money for a college student. All it took was a bit of ingenuity and the power of an idea. Ideas are powerful and can lead to unexpected, crazy things. In our society, I believe that our ideas are squelched at nearly every turn, before we are ever able to breathe life into them. We are told to be practical, and big ideas and creativity are often frowned upon. I’m sure the guy got his fair share of laughs — “Oh, you’re going to sell Christmas sweaters? !” And look where he is now! To think that all of this started with an idea. All of the biggest brands and all of your favorite products, started with an idea. So whether you are a college student, side hustler extraordinaire, or all-around money maven, foster your ideas. Let them grow. Test your boundaries and kill that inner critic that tells you your idea is ridiculous or stupid. It probably isn’t — and if it is, you keep going with the next idea. As a solopreneur, I am starting to hone my ideas and my vision for what I want out of my career and my life. I am starting to listen to that crazy voice in my head, the one that is hiding in the corner, scared to be let out — but I am letting it out and hearing it roar, and the results are remarkable. 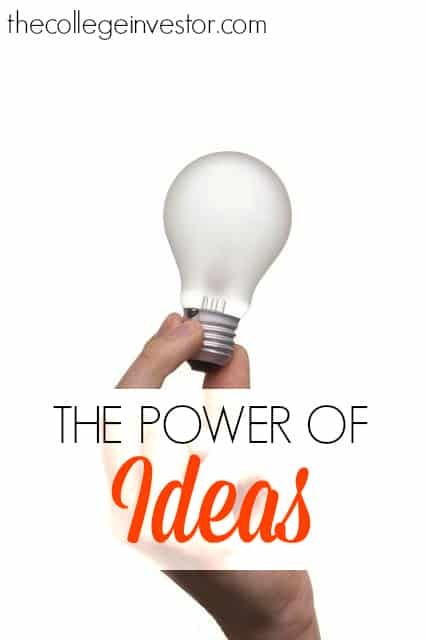 Ideas are powerful — they can change your life and make you rich, literally. The best ideas solve problems, educate, or entertain. By doing so, they connect with others and have the ability to spread like wildfire. In short, foster your talent and keep working hard, but also foster your ideas. Keep your imagination alive and don’t shy away from the unconventional. Who knows — it could be “the next big thing”.